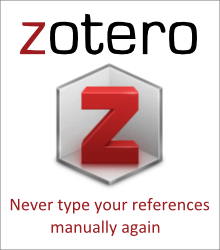 Zotero is a tool for automatically generating your references in whatever format you please, from documents that you find online. It works by collecting "COinS", little snippets of metadata, on webpages. You may add or remove a page from your reference list at the click of a button, with no manual entry or formatting required. We're pleased to announce that PhysicsOverflow now supports Zotero. You are recommended to install Zotero in case you need to cite PhysicsOverflow for whatever reason. This would be especially useful in the Reviews and Open Problems sections, but may also be of use in the Q&A section. You may get zotero either as a standalone extension for Firefox (which is the most full-featured of all), or as a client for Windows, Linux, or Macintosh, along with an extension for Chrome/Chromium or Safari (not available on Opera and IE).